Here we are at Day 91 of Project 365. It’s Friday night and the weekend is before us. Tonight the kids were watching some streaming movies via Netflix and the Nintendo Wii. It’s actually pretty slick. You put the Netflix CD in the Wii and it connects up to our Internet via a wireless connection. There is a nice interface that you navigate with the Wii controller to browse all the streaming movie content. Just select a movie and then play and you are watching a movie. Of course what good is a movie if you don’t have popcorn to eat. I microwaved this batch and then made the kids wait while I took a few photographs. I set this shot up similar to yesterdays Sliced Bread shot except I used two flashes tonight. 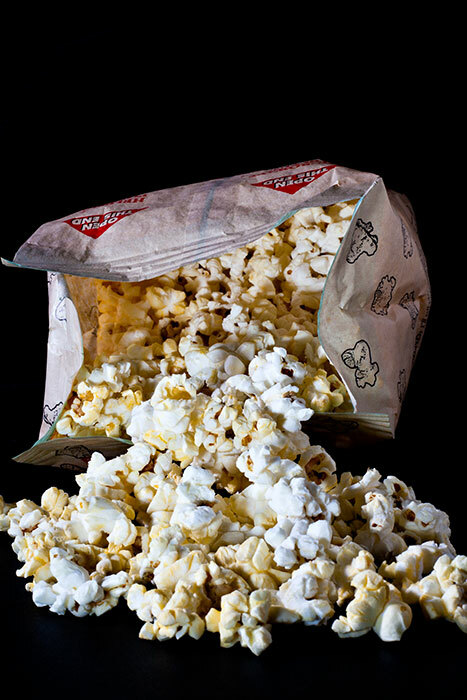 The first flash was positioned in front of the bag of popcorn on the same surface and aimed at the bag. I wanted to get light inside the bag so the popcorn would be visible. I realized this was necessary after a few initial test shots. With the first flash positioned a few more test shots indicated that there wasn’t enough light getting on the outside of the bag. So I positioned a second flash camera left, up high and with a Lumiquest Softbox III attached. I shot this flash at full power. Things were starting to look better. I now had the popcorn inside the bag lit up and the outside of the bag lit up but I wasn’t getting the right side of the bag like I wanted. I rectified this by placing a white book just out of camera range to bounce light from the second flash back onto the right side of the bag. As you can see this worked beautifully.